Master AND and OR outputs monitor the four voting circuits. AND goes HIGH when the outputs of all four comparators are HIGH. OR goes HIGH when the output of at least one of the four comparators is HIGH. The outputs of the four comparators are used to drive the flip-flop memory cell, providing SET, RESET, CLOCK and DATA inputs. When the SET comparator output is HIGH, it will set the Q output (K) of the first Memory cell HIGH. When the RESET comparator output is HIGH, it will set the Q(inv) output (L) of the first Memory cell HIGH. Note that when both the SET and RESET comparator outputs are HIGH, both the Q and Q(inv) outputs of the first memory cell will be HIGH. When the inputs change, the memory cell will take on the state of the last of the two inputs to fall LOW. The memory cell can also be programmed with a two-step procedure. The output state of the DATA comparator will be clocked into the first memory cell when the output of the CLOCK comparator goes from LOW to HIGH. 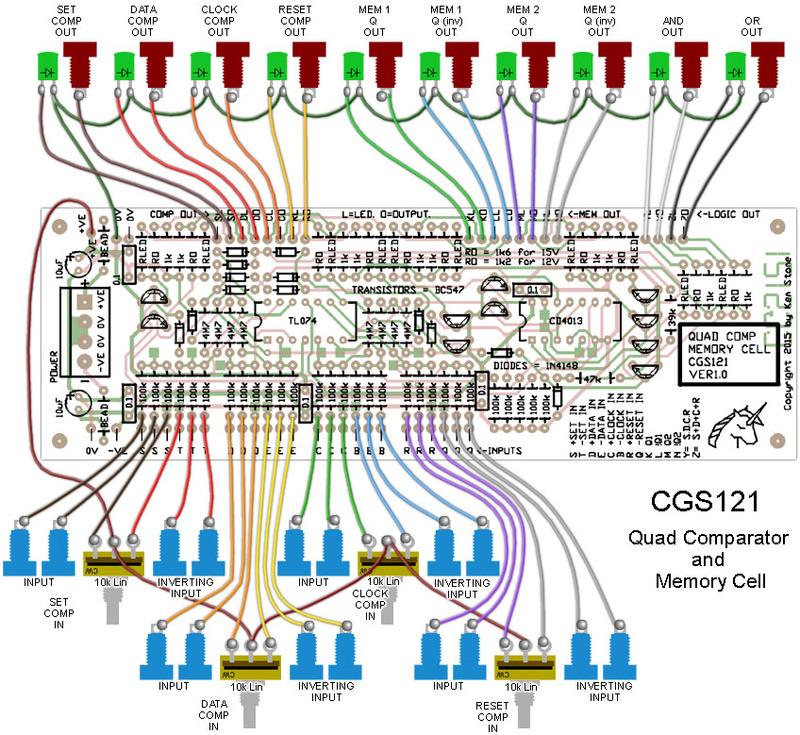 At the same time, the previous state of the first memory cell will be loaded into the second memory cell, the result being available at outputs M and N.
The schematic for Quad Comparator and Memory Cell module. 1/8W, 1/4W or small bodied 0.6W resistors may be used. 5% carbon resistors are sufficient, although metal film resistors can be used. The value of RLED is chosen via experimentation. Take an example of your chosen LED, and connected it via a 1k resistor to your supply voltage (+12V or +15V). For a more accurate test, add a diode in series. Look at the LED. If it dazzles you, you need to increase the value of the resistor. If it is too dark, reduce the resistor. Only old, low mcd LEDs will need a low value resistor. I prefer to use high mcd/super-bright/ultra-bright LEDs with resistors in the range of 10k (for red/amber/yellow) to 33k (for green/blue). Using high mcd/super-bright/ultra-bright LEDs reduces the switching noise placed by the LED on the power rails, reduces power consumption and reduces waste heat. The unit will run on either +/-12 volts or +/-15 volts. Different values for the RO resistors are recommended for use with the different voltages. For +/-12 volts, use 1k2. For +/-15 volts, use 1k6 or something close to that (1k65, 1k62, 1k5). On the rear of the PCB are various surface mount pads. Two under the 4013 are for emergency use, if you find the second cell does not clock properly. In that case, the two pads connected with a short track need to be separated and a resistor (e.g. 10k) needs to be soldered there. The other location is for a capacitor (e.g. 100pF). Keep the relationship between them more or less the same, e.g. 1k : 1n. Increasing either value will improve the clocking at the cost of maximum speed. In all likelihood, this issue will only arrive if you have sub-standard chips. Other surface mount pads, marked 47k, are used by the balance pots, and only need be installed if you use them, and do not put the resistors directly on the rear of the pots themselves. The remaining surface mount pads are expansion points for adding more inputs to the voting circuits. If you are going to be adding a lot of extra inputs, it is probably easier just to mount the resistors directly on the panel jacks, and run a single wire back to the board. The wiring guides will show the details. -VE - rail for panel use. There are three of each input available. The inputs are grouped in pairs, the non inverted and inverted inputs for each function being next to each other. The inner pair of each input group (e.g., ST) have the option of adding 47k SMT resistors on the rear, for the use with a bias pot. The bias pot affects both the non inverted and inverted inputs, allowing you to raise the trigger point on one while lowering it on the other. This allows the reduction of the number of pots needed on the front panel, compared with the use of individual pots for each input type. The bias covers the range from around -5V to +15V. This diagram shows generic wiring using only provided connection points. The 47k SMD parts MUST be installed for this wiring to work.